Franklin Avenue and Flower Avenue aren't the first two roads that come to mind when people think about Four Corners. While Colesville Road and University Blvd. are the biggest roads in Four Corners, smaller roads like Dennis, Franklin and Flower Avenues form important connections between our community and those surrounding us. Because of heavy traffic on Colesville and University, Franklin and Flower are frequently used as back-ways to get to places like Downtown Silver Spring. Flower Avenue parallels University Boulevard from New Hampshire Avenue to Franklin Avenue, passing through Takoma Park, Long Branch, and Indian Spring. Along its route Flower Avenue intersects with heavily traveled roads such as Carroll Avenue, Piney Branch Road, and Wayne Avenue. Because Flower Ave. does not intersect with University Blvd or Colesville Road directly, most of its traffic is dumped on to East Franklin Avenue. Merry Christmas to all Four Corners residents. I always enjoy Four Corners at Christmas time because of all the unique ways we celebrate the holiday season. We do a lot of things that other communities don't do because they don't have the same close knit feel as ours. We have decorating contests, tree lightings, caroling, and Santa visits. It is a great time of year to be a Four Corners resident! As many of you already know, North Four Corners Park is being completely rebuilt. This project has been in the works for about 15 years now, but construction only started a couple months back. This project is significant because it it finally makes use of the large empty lot that used to be home to the Yeshiva school. Above is a picture of the plan for the new park. The area that was once the Yeshiva property will now be the location of a new rectangular athletic field. 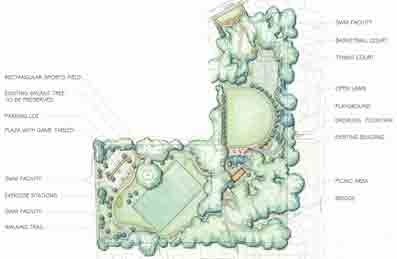 The old soccer field will become a semi-circular grassy area surrounded by landscaping and walking paths. The recreation center, playground, and tennis/basketball courts will stay in their present locations. The park will have direct access from University Blvd with a new parking lot and entrance. The ongoing debate surrounding BRT is one of the reasons I created this blog. I noticed that there was a lot of misinformation surrounding the proposals, and that I myself didn't really understand what BRT meant for Four Corners. Before delving into that controversial topic, I figured it was necessary to establish what the current traffic situation in Four Corners is and what options are available to alleviate it. Everyone knows that the traffic is bad, but it is important to understand why the traffic is bad if we are to find the best possible solution for our community. Our community has always been a crossroads, it's the reason the name "Four Corners" exists. Route 29 has long been a major route between the D.C. area and the Columbia/Baltimore area. University Boulevard is one of the few east-west roads in eastern Montgomery County/northern Prince George's County. Then of course there is the Capital Beltway, with its 8 lanes of rush hour joy. Because these 3 congested roads intersect in our community, it means we have a ridiculous amount of traffic. Until the early 1960s, Four Corners was a simple intersection. Both Colesville Road and University Boulevard (Bladensburg Road back then) were two lane roads. Now both of those roads are 6 lane highways, and they amount to 20 total lanes of auto traffic at the intersection itself when turn lanes are included. There have been various projects over the years to alleviate congestion, but they have only served as attempts to satisfy current demand, and they have not provided long term relief to our community's traffic situation. The most recent upgrade to the intersection was in the late 90's. This upgrade expanded the size of the jughandles on University Blvd and added new turn lanes to both roads. The upgrade also included wider sidewalks on Colesville and University in the immediate vicinity of the intersection in anticipation of the new Blair High School. The 1996 Four Corners Master Plan goes into great detail on past intersection improvements as well as the most recent (late 90's) improvements which were implemented as result of the plan. Anyone who has been through Four Corners lately can see that these improvements have done little to improve, or even keep up with, the current traffic levels. Part of the reason for the ever increasing amount of car traffic in Four Corners is the lack of other viable transportation options. For many people travelling through Four Corners, using a car is the only feasible option they have. Buses get bogged down in the same traffic that cars do, providing a disincentive for potential riders and frustrating current transit users. Bicycle facilities are virtually non-existent. If a Four Corners resident wants to bike to nearby Downtown Silver Spring, a reasonable distance of 2 miles, they cannot do so without riding on a hazardous 6 lane highway with no bicycle infrastructure whatsoever. Cyclists must ride in congested high speed car traffic, or ride on narrow sidewalks with little margin for error. The pedestrian experience is hostile and downright dangerous. The sidewalks, aside from the newer brick lined ones immediately adjacent to the intersection, are only 4 feet wide with no buffer between the sidewalk and the adjacent travel lanes. This means that someone walking along these sidewalks is less than 3-4 feet from cars, trucks, and buses travelling up to 50 MPH. This kind of situation actively discourages walking, even in cases where walking would be more efficient than driving, such as short trips to local businesses by residents who live within half a mile of said businesses. The result is the current situation, where the majority of people travelling through and around Four Corners do so by car. So how can Four Corners reduce the current unsustainable levels of car traffic? How can we do so without damaging our community? How can we prevent cut-through traffic on our residential streets? Will BRT solve any of these issues, or just make traffic and the pedestrian experience even worse? Over the next few posts in this series, I will look at the pros and cons of different traffic scenarios and attempt to identify what solutions would work best for residents of Four Corners, as well as those who have to travel through our community on a daily basis. Starting a Four Corners blog! Welcome to Around The Corners! I've created this blog to foment a healthy discourse between neighbors about the future of our community. This blog will cover a broad range of issues relating to and affecting Four Corners. I got the idea for this blog after reading Dan Reed's blog Just Up The Pike. Dan does an excellent job of covering issues affecting eastern Montgomery County, but he doesn't post much about Four Corners. I did some searching and I found that every area around Four Corners has some kind of blog or Patch site covering it, but aside from local listervs, Four Corners doesn't have anything of the kind. So I decided to start this blog because I don't think Four Corners should be an afterthought. I created this blog to showcase what makes Four Corners unique and how we can all make our community an even better place through shared knowledge. I plan to cover several different aspects of Four Corners' past, present, and future. I plan to profile local businesses and institutions as well as the people and history that make our community a great place to live. I will also focus on proposed changes to our community and how they will impact Four Corners residents. I've decided to name it "Around The Corners" because I wanted a name that alluded to my intention to cover all four neighborhoods as well as the community as a whole. I look forward to the civil discussions this blog will brig about, and I hope it helps make Four Corners the best place it can be. Enjoy the blog! One of the Four Corners signs on University Blvd.